Since their inception 60 years ago, satellites have gone on to become an indispensable component of our modern high-tech civilization. But because they’re reliable and practically invisible, we take their existence for granted. 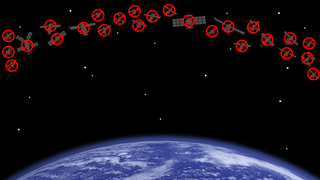 Here’s what would happen if all our satellites suddenly just disappeared. The idea that all the satellites — or at least good portion of them — could be rendered inoperable is not as outlandish as it might seem at first. There are at least three plausible scenarios in which this could happen. As portrayed in the soon-to-be-released science fiction thriller Ghost Fleet: A Novel of the Next World War, satellites could be deliberately knocked out of action by warring nations. In this book, set in the near future, authors P. W Singer and August Cole describe describe a war in which the Chinese military use anti-satellite satellites to direct high-energy weapons at sensitive U.S. targets. Dozens of satellites are rendered useless before the action on the ground even gets started. Alternately, our satellites could get wiped out by a massive solar storm. A so-called Carrington Event — like the one that happened in 1859 — would wreak tremendous havoc to a modern civilization like ours. As Universe Today’s Fraser Cain explains, a sufficiently powerful geomagnetic storm would overload power grids on Earth and fry all of our devices in orbit. Cain says the several hundred geosynchronous satellites orbiting the Earth right now are vulnerable, including the GPS network that orbits at about 20,000 km (12,430 miles). Lastly, there’s the Kessler Syndrome to consider. This scenario was portrayed in the 2013 film Gravity. In the movie, a Russian missile strike on a defunct satellite inadvertently causes a cascading chain reaction that formed an ever-growing cloud of orbiting space debris. Anything in the cloud’s wake — including satellites, space stations, and astronauts — gets annihilated. Disturbingly, the Kessler Syndrome is a very real possibility, and the likelihood of it happening is steadily increasing as more stuff gets thrown into space. Given these grim prospects, it’s fair to ask what might happen to our civilization if any of these things happened. At the risk of gross understatement, the complete loss of our satellite fleet would instigate a tremendous disruption to our current mode of technological existence — disruptions that would be experienced in the short, medium, and long term, and across multiple domains. Almost immediately we’d notice a dramatic reduction in our ability to communicate, share information, and conduct transactions. “If our communications satellites are lost, then bandwidth is also lost,” Jonathan McDowell tells io9. He’s an astrophysicists and Chandra Observatory scientist who works out of the Harvard-Smithsonian Center for Astrophysics. McDowell says that, with telecommunication satellites wiped out, the burden of telecommunications would fall upon undersea cables and ground-based communication systems. But while many forms of communication would disappear in an instant, others would remain. All international calls and data traffic would have to be re-routed, placing tremendous pressure on terrestrial and undersea lines. Oversaturation would stretch the capacity of these systems to the limit, preventing many calls from going through. Hundreds of millions of Internet connections would vanish, or be severely overloaded. A similar number of cell phones would be rendered useless. In remote areas, people dependent on satellite for television, Internet, and radio would practically lose all service. It’s important to note that we actually have a precedent for a dramatic — albeit brief — disruption in com-sat capability. Back in 1998, there was a day in which a single satellite failed and all the world’s pagers stopped working. We would also lose the Global Positioning System. In the years since its inception, GPS has become ubiquitous, and a surprising number of systems have become reliant on it. “Apart from the fact that everyone has forgotten to navigate without GPS in their cars, many airplanes use GPS as well,” says McDowell. Though backup systems exist, airlines use GPS to chart the most fuel-efficient and expeditious routes. Without GPS and telecomm-sats, aircraft controllers would have tremendous difficulty communicating with and routing airplanes. Airlines would have to fall back to legacy systems and procedures. Given the sheer volume of airline traffic today, accidents would be all but guaranteed. Other affected navigation systems would include those aboard cargo vessels, supply-chain management systems, and transportation hubs driven by GPS. But GPS does more than just provide positioning — it also provides for timing. Ground-based atomic clocks can perform the same function, but GPS is increasingly being used to distribute the universal time standard via satellites. Within hours of a terminated service, any distributing networks requiring tight synchronization would start to suffer from “clock drift,” leading to serious performance issues and outright service outages. Such disruptions could affect everything from the power grid through to the financial sector. A somewhat alarmist video produced by the Marshall Institute, but one that raises some relevant points. Wireless services, especially those built to CDMA standard, would fail to hand off calls from one cell to the next, leading to dropped connections. Computer networks would experience slowdowns as data is pushed through finite pipelines at reduced bit rates. The same would be true for major networks for communication and entertainment, since they are all IP-based today and require ultra-precise timing to ensure digital traffic reaches its destination. The lack of effective synch would hit especially hard in banking, where the timing of transactions needs to be recorded. Credit card payments and bank accounts would likely freeze, as billions of dollars could be sucked away from businesses. A financial crash is not out of the question. The sudden loss of satellite capability would have a profound effect on the military. The Marshall Institute puts it this way: “Space is a critical enabler to all U.S. warfare domains,” including intelligence, navigation, communications, weather prediction, and warfare. McDowell describes satellite capability as as the “backbone” of the U.S. military. Today there are some 1,100 active satellites which act as the nervous system of not just our economy, but also our military. Everything from communications to GPS to intelligence all depend on it. Potential foes have noticed, which is why Russia and China have recently begun testing a new generation of anti-satellite weapons, which in turn has sparked the U.S. military to recently budget $5 billion for various space warfare systems. What would happen if we lost access to space? Well, the battles would, as one U.S. military officer put it, take us back to the “pre digital age.” Our drones, our missiles, even our ground units wouldn’t be able to operate the way we plan. It would force a rewrite of all our assumptions of 21st century high tech war. We might have a new generation of stealthy battleships...but the loss of space would mean naval battles would in many ways be like the game of Battleship, where the two sides would struggle to even find each other. Moreover, and as McDowell explains to io9, the loss of satellite capability would have a profound effect on arms control capabilities. Space systems can monitor compliance; without them, we’d be running blind. One great thing satellites have done for us is improve our ability to forecast weather. Predicting a slight chance of cloudiness is all well and good, but some areas, like India, Pakistan, and Bangladesh, are dependent on such systems to predict potentially hazardous monsoons. And in the U.S., the NOAA has estimated that, during a typical hurricane season, weather satellites save as much as $3 billion in lives and property damage. There’s also the effect on science to consider. 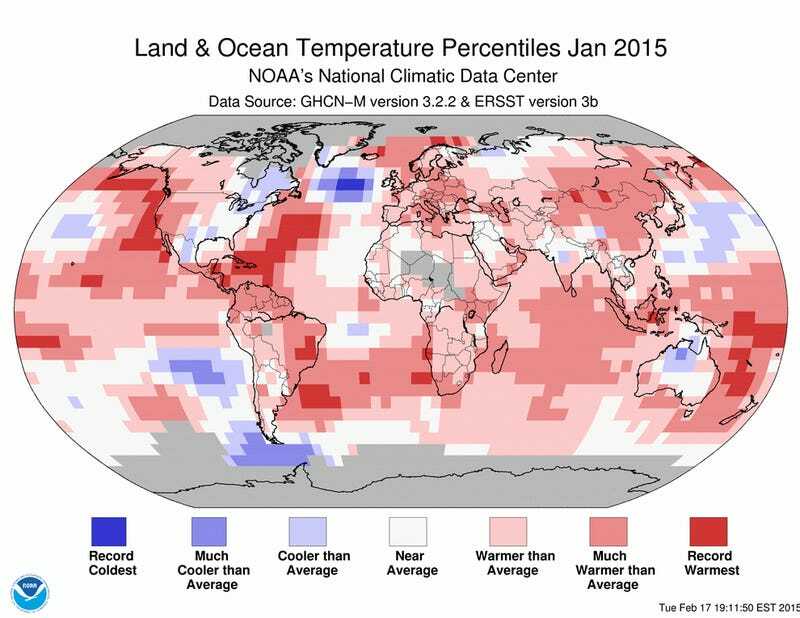 Much of what we know about climate change comes from satellites. As McDowell explains, the first couple of weeks without satellites wouldn’t make much of a difference. But over a ten-year span, the lack of satellites would preclude our ability to understand and monitor such things as the ozone layer, carbon dioxide levels, and the distribution of polar ice. Ground-based and balloon-driven systems would help, but much of the data we’re currently tracking would suddenly become much spottier. “We’re quite dependent on satellites for a global view of what’s happening on our planet — and at a time when we really, really need to know what’s happening,” says McDowell. It’s also worth pointing out that, without satellites, we also wouldn’t be able to monitor space weather, such as incoming space storms. With all the satellites gone, both governmental and private interests would work feverishly to restore space-based capabilities. Depending on the nature of the satellite-destroying event, it could take decades or more to get ourselves back to current operational standards. It would take a particularly long time to recover from a Carrington Event, which would zap many ground-based electronic systems as well. As for getting full-sized, geostationary satellites back into orbit, that would prove to be a greater challenge. It can take years to built a new satellite, which typically requires a big, costly rocket to get it into space. Lastly, if a Kessler Syndrome wipes out the satellites, that would present an entirely different recovery scenario. According to McDowell, it would take a minimum of 11 years for LEO to clear itself of the debris cloud; any objects below 500 km (310 miles) would eventually fall back to Earth. Thus, we would only be able to start re-seeding LEO in a little over a decade following a Kessler event. Unfortunately, the area above 600 km (372 miles) would remain out of touch for a practically indefinite period of time; objects orbiting at that height tend to stay there for a long, long time. We’d probably lose this band for good — unless we manually removed the debris field, using clean-up satellites or other techniques. It’s worth noting that a single Kessler event could hit the LEO zone or the GEO zone (geosynchronous orbit) but realistically not both; LEO debris could never reach GEO, and vice versa — though a spent rocket in GTO (geosynchronous transfer orbit) or SSTO (supersynchronous transfer orbit) passes through or near both zones and could potentially affect either of them. The spent rockets in GTO do not stay too close to the GEO arc for long due to orbital perturbations, so a GEO Kessler event is very unlikely to be triggered by one of them. Suffice to say, we should probably take the prospect of a Kessler Syndrome more seriously, and be aware of what could happen if we’re no longer able to use these spaces. Note: An earlier version of this article incorrectly equated the height above 600 km with Geosynchronous Earth Orbit (GEO). Info about LEO and GEO as it pertains to a Kessler event were also added.